My father was a huge influence on my life as a young boy. At 6’4” with a 52” chest, he was physically and temperamentally a very impressive man. He had hazel eyes, black hair, a dark complexion, and the tattoo of an anchor on his left forearm which he’d carved himself as a schoolboy with a scratchy nib and a pot of black ink. 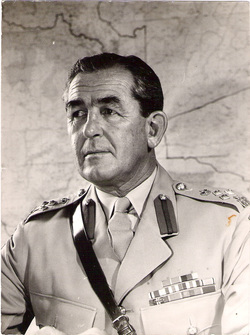 In 1957, he was appointed the OBE as Lieutenant-Colonel of the Rhodesian African Rifles, and in 1963, he was appointed the CBE as Brigidier of the Rhodesia and Nyasaland Army. But to us three boys, he was always ‘Dad’. He was born in Uitenhage in South Africa in 1913, and although he was a native African, he always thought of himself as a Scot. There was a certain logic in his belief, as both his father and mother had been Scots. My grandmother, Betsy, was a Campbell, and my great grandfather, John, had been a compositor with the Edinburgh Evening News. And this lineage was enough for Jock to consider himself a Scot. So much so that, whenever he found himself speaking to a Scotsman, he’d adopt a strange Scottish accent, which was always a cause of great embarrassment to us three boys. There were even certain Scottish traditions introduced into our family life. We all had to have salt on our porridge, because that’s what the Scots do. And Jock used to sing Scottish songs to us at the slightest provocation: ‘Scots wahey when Wallace bled.’ When we were small, he made us all wear kilts. So John had an Anderson tartan because he was the eldest son. I had a Black Watch kilt because my dad had been in their Second Battalion in the Second World War. And Colin had a Fraser tartan, because his name was Colin Fraser and so it somehow seemed logical to give him a Fraser tartan! We used to go to birthday parties, thinking it was frightfully smart to be wearing our kilts. Of course we were ragged to hell by all the other kids. Of course we’d be wearing underpants. Christ Almighty, even Jock wasn’t that Scottish! Our appearance was very important to my father, who believed that his sons should at all times look impeccable. To which end he started making hair oil. It was 1959 and I was about 12, and we were living at 91, North Avenue, Salisbury, with Joseph Mbulawa and Eva Ncube and their son Silvo. By this time, Jock was a celebrated soldier, who had joined the army as a corporal and had now become a brigadier in the huge federal army, incorporating Northern Rhodesia, Southern Rhodesia and Nyasaland. And he decided that, as the sons of a brigadier, we should wear our hair smart. Jock always sported a parting in his hair. And to this day, my brother John still has a parting in his hair. Though Colin and I don’t – we’ve rebelled. But in those days Jock insisted that we definitely all had partings. And off he went to Baird and Tatlock, the chemist’s, where you could buy Bunsen burners and pipettes and burettes and things like that, but you could also buy flowers of sulphur and saltpetre and ingredients for making gunpowder. Jock came back from Baird and Tatlock with gum tragicanthe and spirits of lemon. Spirits of lemon was a very strong smelling liquid and gum tragicanthe looked like crystals. Jock mixed the ingredients in the precise proportions that he remembered from his days as a pharmaceutical chemist with Walter Phipps in Springs, South Africa, the year before he went to university. It was as a chemist’s assistant that he also learnt to wrap things. My dad could wrap parcels of any shape or size. Give him a champagne bottle he could wrap it. Give him a glass he could wrap it. Give him a rack of knives he could wrap the whole damn thing to make it look like something else. You could give him a piece of sea sponge and he could wrap it. A rifle and he could wrap it. He could wrap any article known to man. And he’d wrap it beautifully, because that’s what he did. He was a perfectionist, even in a simple wrapping task. So he mixed up this hair oil, and he made hundreds of bottles of it, wine cases of it. And it really was the most fantastic hair oil in the world. You’d wet your hair after a bath. (There weren’t any showers in those days.) You’d put a blob in your hand. (It looked like sperm – the same colour and consistency.) You’d push it through your hair to make your whole head wet with the stuff. Then you’d comb your hair into whatever shape you wanted. What’s more, it had a slight sheen as it dried, but it never looked greasy. Of course, if Jock was around, you’d comb your hair into a parting, absolutely arrow-dead straight. (My father wouldn’t tolerate a parting that was standing at ease when it should’ve been standing to attention. A good parting was like a row of soldiers with their eyes right.) But when dad wasn’t around, the sky was the limit. With this stuff on your head, I tell you, a Force 10 tsunami wouldn’t knock a hair out of place. It was Rock Solid – whatever shape you wanted! You could tie your hair in a bow, put Jock’s hair oil on it, leave it for ten minutes, and then that bow would be there, absolutely exact. You could drive the Bulawayo-Salisbury Express train right through it and it wouldn’t make any difference: the train would go right over your head and your hair would spring back into place. It was quite the most amazing stuff. Friends would say, ‘How do you keep your hair like that?’ And we’d bring them a bottle of Jock’s Hair Oil. Jock had had an interesting career, which evolved and emerged in his early adulthood. After his time as a chemist’s assistant, he went to Wits University in 1932 as a part-time student of Metallurgy. During the day, he worked at the Springs Mine, assaying and sampling, and in the late afternoons and evenings, he went to all his lectures and tutorials. But by 1937, he’d had enough of South African politics. So he applied for a job in Rhodesia and he got it. From the moment he arrived, Rhodesia impressed him. Godfrey Huggins was Prime Minister at that time and, in my father’s eyes, the whites and the blacks seemed far more contented together than they did in South Africa. But really Jock was a soldier through and through, and two years later, when it was clear that war was pending, he joined the Reservists in Bulawayo. The very day the war broke out, he was called up. Jan Smuts, who was head of the Nationalist Party of South Africa at the time, had committed the South Africans to fighting in North Africa (though not in Europe), and Jock enlisted as an Acting Corporal (No R.2763816) in the Second Battalion of the notorious Scottish regiment, the Black Watch. It was with the Black Watch that Jock had his first experience of real warfare when they went up to British Somaliland and undertook a rearguard action. The Italians were making their push into the country, and Jock was part of what must have been one of the last bayonet charges of the Second World War. Trench warfare had all but disappeared at the end of the 1914-18 War, but in British Somaliland, the Black Watch found themselves facing a brigade of Italians. They’d been shelled for about a week, when the Company Commander of the Second Batallion suddenly ordered the Black Watch to fix bayonets to their rifles and attack the poor unsuspecting Italians, even though they were little more than three hundred yards away. As the company of mad Scots advanced upon the enemy with fixed bayonets and a piper blasting on the bagpipes, the Italians hauled themselves out of their trenches and ran for dear life. Then the soldiers next to Jock began firing at the Italians, and carnage ensued, with a certain warrior ignominy, as Black Watch Company B shot the Italians in the back as they scarpered. Then they ran up to the prone Italian bodies and speared them with their bayonets just so that they could come back with enemy blood on their blades. The truth was that the Second Battalion was a real rag, tag and bob-tail regiment. They’d been recruited from the slums of Dundee, Aberdeen and Glasgow, because the First Battalion Black Watch had all been captured in Crete when the Germans had landed on the island. Jock had some dreadful tales of being in the Black Watch. Like the time they were in the barracks at Cairo and one of the soldiers had gone out one night with an Arab girl. He’d been caught by a bunch of Arabs and brutally castrated. They’d chopped off his balls, sewn them up in his mouth, and dropped his body outside the camp. The quarter guard had immediately raised the regiment, and within half an hour they’d gone into Cairo and killed about eighteen Arabs. They’d stuck their bayonets into them and done the most frightful things. Another of the Black Watch’s tricks was to lace their bonnets with razor blades. They’d split the seams of their bonnets, break the razor blades in half, sew them into their bonnets, and iron the seams flat over the blades. When they flicked their bonnets, all these razor blades would come flying out. Then they’d go into a bar and create absolute bloody havock – just because they liked fighting. They really were the Scum of Everywhere. Jock didn’t stay long with the Black Watch. In December 1940, a cavalry regiment was raised called the Rhodesian Armoured Cars, which were part of the South African Defence Force. So Jock left the Black Watch to join the RAC. When the North Africa campaign had finished and the Germans and Italians had all retreated, Jan Smuts withdrew the South African Defence Force since their brief had been to fight only in Africa, not Europe. My dad thought about going back into mining, but really he wanted to carry on fighting – he’d developed a sort of lust for it, I think, and he didn’t really want to be repatriated. So in 1943, he and his friend Colin Shaw (after whom my younger brother is named) set off wandering around North Africa with ‘Rhodesia’ on their shoulders. Before long, they bumped into this frightfully British army officer called Roderick Amery (after whom I get my middle name). These were the Blues and Royals, who now stand guard outside Buckingham Palace, and they were a frightfully pukka British cavalry regiment. They always used the best silver. Yes, they’d be fighting a major war in various parts of Europe and blasting the hell out of the enemy, but every night they’d settle down to dine with full mess silver. Yet despite their propriety, the Royal Dragoons were the worst looters in the world; my dad had cases of loot. When they were going through France, they pilfered bottles and bottles of Crème de Menthe. Not to mention the vegetables. He didn’t have many tales of the war, my father, but those he did have were always to do with food and drink. Like the time the regiment trooped into a village in Holland and Jock went into one back garden to discover they were growing asparagus. ‘Asparagus!’ he thought. ‘Let’s have some of that for dinner.’ But as he was cutting the asparagus from the asparagus bed, he looked down and realised that he was standing in a minefield. The Germans had sown the whole asparagus bed with mines. He called to his troop, who then delicately extricated him by finding the mines with their bayonets. There certainly seemed to be something insuperable about my dad, something invincible. When he joined the Royal Dragoons, he was given his first armoured car – along with a driver called Friggins. On meeting Friggins, he found the driver standing with a hose in his hand. ‘What are you doing?’ quizzed Jock. It turned out that Friggins had already lost two commanders, and Jock was his third protégé. My dad went through the rest of the war with Friggins and managed to stay alive. Yes, there was something insuperable about my dad. After the war ended, Jock joined the newly formed Southern Rhodesia Staff Corps, which began with just twenty men. They all had to undergo a course of drill and weapon training, even though they’d just been through the whole bloody Second World War! The training was quite ridiculous as they knew far more than their instructors. Eight months later, Jock was commissioned. In 1950, when I was just 3, Jock was sent over to Staff College at Camberley in England. Daph brought me and John with her (Colin wasn’t born yet), though I don’t remember anything about the year in England – probably because of the blow to the head from Poo MacKay in the swimming pool. There are pictures of me and John in Trafalgar Square with pigeons on our heads, so I believe that I must’ve been there, but I just don’t remember a thing. After the year in England, we all came back to Rhodesia by boat – this time, with a tiny baby in tow, as my younger brother, Colin, had been born while we were out there. As we docked in Cape Town, I started to scream and scream: at 3 years old, I’d completely forgotten what black people looked like and it was all rather disconcerting. In Salisbury, we moved into George VI Barracks, where Jock had been made a Grade 2 staff officer at the Army Headquarters, responsible for organising the training of the territorials. And now a spirit of change was certainly in the air. Up until this point, army training in Rhodesia had been fairly random, with just an hour or so’s drill for a couple of nights a week in the Salisbury Drill Hall and an annual three-week training held out in the bush in temporary camps. But now – in the early 1950s – compulsory conscription was introduced, and from that moment on, life for a young Rhodesian male was changed entirely. As soon as he turned 18, he had to register for the territorials. And if he was fit enough to pass the medical exam, he’d have to turn up to the training. The permanent camp at Nkomo was set up and the buildings at Llewellin Barracks were expanded. Did Jock know the country had to have more troops, that the tide would surely turn? Was it at this point that the Government visualised a time when African discontent would become more and more volatile. There was certainly a sense, in the words of a popular song, that: ‘There may be trouble ahead’.